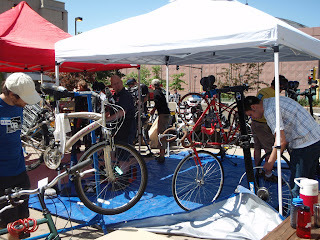 I spent the better part of the day today outside the convention center, helping to repair bikes for homeless people. Project Homeless Connect aggregates medical and social service providers a few times per year to make it easier for people needing these services to get them. A significant number of homeless and transitional people rely on bicycles for transportation, and they often ride marginally safe bikes, so appending a bike-repair effort on to Homeless Connect is a good idea. I got involved with this last year because a friend organized the bike repair effort and found herself swamped with demand for these services. This year we were able to apply a lot of lessons learned and it went much better. 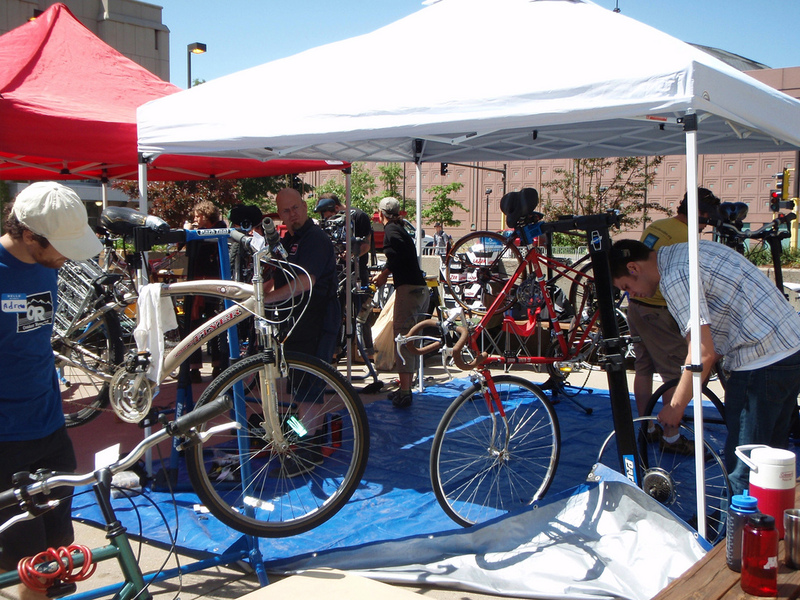 Upgrades to our set-up this year included getting about 9 mechanics (including 3 from The Hub Bike Co-Op), more parts and supplies (brake pads, cables, housing, inner tubes, tires, etc. ), awnings to provide shade, lunch and a much better in-take process. Kudos to Nickel for figuring this all out and making it happen. In two instances, I just could not make bikes safe to ride and talked to owners about getting a better ride at Bikes for Change or MMRB, but for the most-part, we got these things much safer and ready to ride. I don't have an official count, but I bet we repaired at least 50 bikes today. This is a really under-served area and more volunteer bike repairs would be a good thing in any city. The Homeless Connect organizers seemed to really appreciate that we were there, too, which is always nice.